This Tuesday (June 22nd at 11am PDT) I’m presenting a webinar on the 7 steps to finding untapped revenue in your marketing database. Do you have many leads in your database who have never been followed up on? If yes, you have a lot of untapped revenue in your database. View this webinar to learn how to generate additional revenue from your existing leads. The webinar is now available for watching on-demand. This entry was posted in lead management, Webinars and tagged b2b marketing, b2b marketing university, lead management, lead nurturing on June 17, 2010 by Jep Castelein. Some of you may know that I’ve been a guest blogger at Genius.com since last summer. The main topic has been Marketing Automation, with several other online marketing topics blended in. On the Genius blog I have some nice introductory articles, so I wanted to provide some links to those post here on the LeadSloth blog. Not Ready for Marketing Automation. Now What? Feel free to provide some feedback in the comments on this blog, or on the Genius.com blog. I’m interested to learn which topics you’d like to hear more about. This entry was posted in Demand Generation, Email Marketing, sales 2.0 and tagged lead management, lead nurturing, lead scoring, marketing automation, metrics, roi on January 14, 2010 by Jep Castelein. Earlier this year I downloaded Silverpop’s lead management workbook, and I planned to write about it. Unfortunately, not enough time… Last week I received a copy of Marketo’s Lead Nurturing workbook. Similar books, but each with their unique approach and lots of smart advice. Both books show how you can increase sales by nurturing all leads, from inquiry to opportunity. Heck, why not nurture customers too? (that is one of the great suggestions in Marketo’s book). Both books cover lead nurturing and ROI calculations, and Silverpop also explains lead scoring. Silverpop’s book is a little more high-level and written in magazine style, while Marketo’s offers more practical advice on how to set up your nurturing campaigns. Read them both! By the way: on August 19th Marketo has a webinar about lead nurturing and on August 20th Silverpop has a webinar about lead scoring (hopefully a recording will be available afterwards). Both books do a good job of describing why you need Lead Management. A proper follow-up ensures that leads are nurtured until they are ready to talk to a sales person. And – because of the nurturing – they are much better educated, making the sales person’s job a lot easier. Because you can follow up with 100% of your leads, and because your sales people can be more effective, you will turn more inquiries into sales. See also my post on the MarketingGenius blog for an introduction to Lead Management, and The 4 steps of Lead Management. Silverpop includes a great overview of Lead Scoring. They explain that sales & marketing need to jointly create a definition of a qualified lead. Then you can implement scoring rules to identify those leads, based on implicit and explicit criteria. Marketo has published separate Lead Scoring Guide with similar suggestions. See also my introduction to Lead Scoring. The word “ROI” is often abused, but not in these workbooks. Marketo provides several worksheets that make it easier for you to calculate your return on lead management. Silverpop presents a 5-step process for proving the ROI. Both vendors suggest to look at conversion metrics between buying stages: from inquiry, via qualified lead and opportunity to a closed deal. This is the best way to get quick indicator of improvements, because waiting for the closed deal can take a while if you have a long sales cycle. Silverpop suggests starting your ROI calculations with a simple metric, such as the number of leads. Marketo has a great recommendation to identify how many opportunities come from fast-moving leads (say under 30 days old) versus older leads (> 30 days old). If you have few opportunities from older leads, your nurturing should be improved. I’ve just published a introductory post on Marketing Automation ROI on the MarketingGenius blog. I don’t want to summarize the entire workbooks in this post, but I’d like to highlight a couple of smart ideas that are mentioned in these whitepapers. Marketo mentions Accelerator campaigns, in which the prospect can choose to speed up the nurturing campaign. A simple and nice idea. Also, their workbook gives lots of examples of their own nurturing processes (used by Marketo themselves): this makes the recommendations come to life. One of Silverpop’s lead scoring tips is to decrease the weight of scoring activities over time: older activities are just not as relevant. But how long should you wait? They recommend to take the length of your average sales cycle to start decreasing, and twice the sales cycle to completely omit the activity. Both papers suggest setting the duration of your nurture campaign to the length of the average sales cycle. By that time the average lead should be sales ready. If not, you can put them on a long-term nurturing program. In principle, leads should not just ‘sit idle’: you either nurture or toss them. Both papers also look at the buyer roles (e.g. economic buyer, end-user, IT, etc.) and the stages in the buying cycle (e.g. awareness and evaluation). For each stage and role you need to have optimized content. Yes, that means a lot of copywriting! 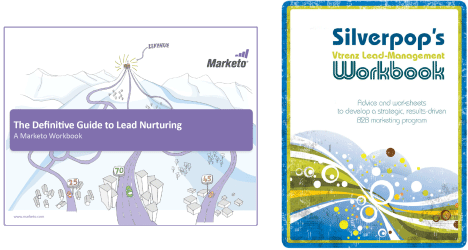 Big kudos to Marketo and Silverpop for creating these comprehensive workbooks on lead management. 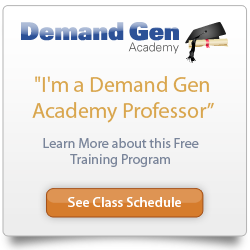 Their best practices are useful for any demand generation practitioner, and are not tied to one particular marketing automation system. And even as an experienced marketer I read several new and interesting ideas in both books. Have you read these books? What do you think: are they good or do you see room for improvement? This entry was posted in Demand Generation and tagged engage b2b, lead management, lead nurturing, lead scoring, marketo, roi, silverpop, workbook on August 17, 2009 by Jep Castelein.